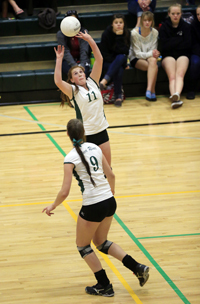 Wood River High and Carey High School volleyball teams stayed alive with big wins this week at their state-qualifying district tournament meets. An efficient team effort enabled coach Tim Richards’ No. 3-seeded Wood River Wolverines to eliminate No. 5-seeded Canyon Ridge 25-11, 25-13, 25-22 Tuesday night in the Great Basin Conference tournament at Twin Falls High School. Wood River (18-16, 8-5 in GBC play) advanced to play the No. 2-seeded Jerome Tigers Thursday night on the same Twin Falls floor for a berth in the State 4A tournament Oct. 26-27 in Idaho Falls. Senior co-captains Lily Richards and Kori Paradis (3 blocks) each had 7 kills for 23 swings and senior Madi Hendrix had her best match with 6 kills for 13 swings, coach Richards said. Sophomore Haley Cutler and junior Mary Petzke chipped in with 2 kills apiece. Sophomore setter Brittney Bradley led the Hailey girls with 20 assists, while Lily Richards contributed 5 aces and 20 serves. Sophomore Ciceley Peavey had 13 digs and Lily Richards 10. At Dietrich High School on Wednesday, coach Kathy Whitworth’s No. 5-seeded Carey Panthers (11-10) stayed alive in the 1A Division 2 Northside Conference tournament with a three-game upset win over the injury-plagued Camas County Mushers. Carey won the third game 25-22 and thus ousted the defending Northside Conference champion and three-time defending State 1A Division 2 winners from Camas County. The No. 2-seeded Mushers were coming off a four-game loss to No. 3 Dietrich (16-6), a fired-up squad that won the district title in five tough games over No. 1 Lighthouse Christian on Wednesday night. Carey moved on to play No. 4 Richfield on Thursday in an elimination match, with the winner going against Lighthouse Christian later Thursday for one of two automatic Northside berths to the State 1A Division 2 tournament Oct. 26-27 at Twin Falls High School. Whitworth said the Carey girls were eager for their rematch with Richfield, having lost to the Tigers in three games Saturday in the opening Northside tournament match at the Dietrich gym.